So you need a Domain Name + a Web hosting account in order publish you website to the internet. 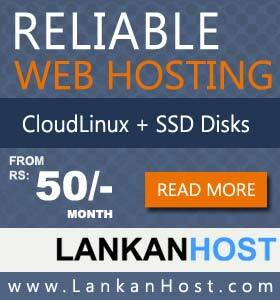 LankanHost provide .com, .net, .org,.lk, .biz domains for sri lankan cliants. You can manage your domain through our client area. We register your domain name under your name. So you will get full ownership of your domain name. We give you total control of your domain name. Change name servers, Lock/Unlock, Change contact Details etc. Please use the above form or use our online order form. You can check the availability of your domain name. Then fill the order form and inform us after the payment. So we can register your domain name within 1-2 hours. What happen if I forgot to renew the domain name? This happen when the domain name has not been renewed by the owner before its expiry date. Then it goes to RENEWAL GRACE PERIOD. This period is 30 Days. You can still renew it in RENEWAL GRACE PERIOD. Your website will not visible in the internet in RENEWAL GRACE PERIOD. You can not renew it now. How ever you can still restore it. But you need to pay higher restore fee. Now your domain is in REGISTRAR HOLD stage. This period is 45 Days. 3. Registrar releases/deletes the domain name from domain registry. After 80 days from it's expiration date,(If you don't renew or restore it) it will delete from the registry. Then domain become available to register anyone. So we recommended to renew your domain before the expiration date. Can I rename the Domain name later? You can't rename domain name. You need to buy a new domain if you want to change the domain name. What is ID protection / Whois guard? The Whois database is accessible to anyone on the internet. When you register a domain, you risk exposing your name, address, email and phone number to spammers, marketing firms. If you purchase ID protection (Whois guard) you can hide your personal details from public whois database. Whois database stores your Name, Address, email address and telephone number. Id protection costs only Rs:400/- Per year. How long do you take to register a domain name? We usually register your domains within 1-2 hours after the payment notice. Can I register my domain for multiple years? Yes. You can register/renew your domains up to 10 Years. to LankanHost from some other company? Now you can transfer your exsisting domain name to LankanHost by filling our domain transfer order form. 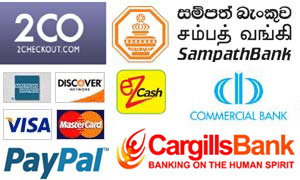 You can easyly deposit / transfer money to our account from the nearest Sampath Bank. Read more about LankanHost payment options. Since 2006, LankanHost provides a reliable web hosting service at the lowest possble price With a lot of web hosting features for such a low price backed up by a 30 Days money-back guarantee.